Hong Kong has two official languages: Cantonese and English. Some people speak both fluently (in my experience, native Hong Kongers who were educated in the UK or US). Most people speak one fluently and the other to some degree. Some people speak only one, and look blankly at an interlocutor when confronted with the other. We are in that last group. Before we left Chicago, we hemmed and hawed briefly about whether to learn a little Mandarin (what the Chinese, including Hong Kongers speaking in English, call “Putonghua,” the ‘common tongue,’ and is the official language of China) or Cantonese (an official language of Hong Kong and Macao and the de facto language in southern China and Chinatowns around the world). On the one hand, it would be cool to order dim sum in Chicago in Cantonese, but on the other hand Mandarin would probably be more useful to us in the longer, post-HK, run. We had also read that a Westerner trying to speak any Cantonese in HK would simply be responded to in English, making practice difficult. Add to that the fact that written Mandarin uses simplified characters while written Cantonese uses the breathtakingly beautiful but breathtakingly elaborate traditional characters, and we figured we’d try a little Mandarin. So, indeed, we tried exactly a little Mandarin. I can count pretty readily, and say things like “Would you like to eat a little something?” I fell off the learnin’ wagon once the packing started, but I’m determined to get going again, if only to try saying something to someone when we get to Beijing, Shanghai, and the like. Transportation and a new appreciation for life, all for one low fare. But then I learned that the university was offering a ten-week Cantonese course intended specifically for new staff and faculty. So of course I signed up. 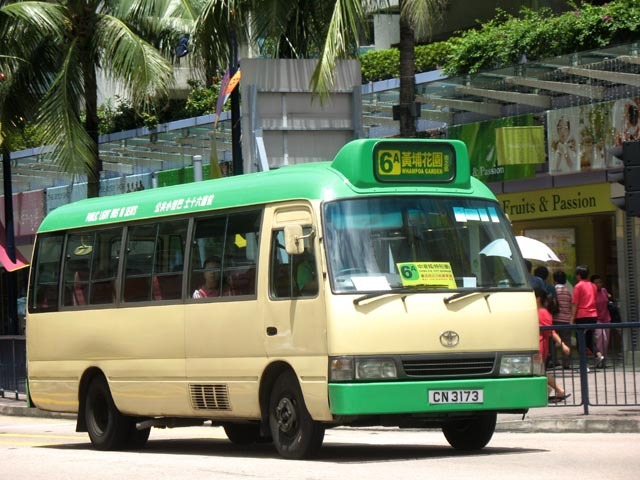 It would be great to have the smallest amount of facility, if only to say “excuse me” when exiting the MTR (note: I’d be the only person bothering to say that, but still) or “next stop, please!” when riding the insane green minibuses that are often the quickest way to get from point to point, as well as the quickest way to stare death in the face. Part of the problem is that Cantonese is really, really difficult. Depending on how you count, Cantonese has either six or nine tones. Each of these has a descriptive name: high rising, low falling, medium level, medium rare, dark justice, hungry kitten, sounds-just-like-medium-level, sudden bop, and Edward. I dutifully attended the first class session, which had clearly been prepared with a great amount of effort by a man who is clearly a very smart scholar who knows a ton about linguistics. One thing he does not appear to know about, however, is language pedagogy. At the first of our two-hour classes, he began by reading off of a handout (which we all had in our hands) about the history of languages in China. This took about 40 minutes. Then he launched into an explanation of the different components of Cantonese syllables and the various consonant and vowel sounds. All good. Then he said “Now listen while I demonstrate the various consonant sounds,” and read through a list of Cantonese words. When he started to repeat the list, we all chimed in and repeated the first word after him. “No!” he said. “Just listen.” So we did, as he read the words again. Then he went on to the list of vowels, which received the same treatment. So now we were an hour in, and hadn’t yet introduced ourselves, said what experience we have with foreign languages (it turns out, for example, that one guy there was conversant in Thai, which has like 300 tones or something), nor uttered a single sound at all, let alone one in Cantonese. This set the tone (nyuk nyuk) for the entire class: we listened while he lectured about how the language sounds. Around 1:20 into the course, he had us run through a list, all together, so that he couldn’t hear what any individual was doing. But I could hear what the guy next to me was saying, and I’m here to tell you—even though I don’t speak Cantonese, I can distinguish between different pitches—that he was no way no how speaking six or nine different tones. Or even more than one, really. This is a picture I took of my Cantonese class after we successfully found the room it was being held in. We made it through Week 1 relatively unscathed, if a little befuddled. I returned last week for the second class, and I’m sorry to report that I will not be returning this week. It’s just not a class where I can learn anything, unfortunately: too much material approached too quickly, and with too little actual speaking practice. I didn’t think that after two weeks I’d be chatting with native speakers, but I did think I’d learn, well, something. So, for now at least, it’s back to Mandarin for me. Rob, you nailed precisely the problem: knowing a lot about anything, but perhaps language and linguistics in particular, does not mean one has a single clue about how to teach that subject to beginners. i’m thinking about the episode of “Big Bang Theory” where Sheldon attempts to teach Penny “a little physics.” Alas, academia is full of great experts who can’t teach their way out of a paper bag. As an English teacher in Switzerland, I was certified while some intelligent folks failed due to not being able to put themselves in the student’s place. I’ve also been an adult language learner and appreciated being taken along the path of language learning. But a tonal language – Jeepers! You’d think that he’d have been a bit more sympathetic to your needs.